Blepharoplasty – eyelid surgery corrects puffy eyelids in Los Angeles by Aaron Stone MD . Eyelid plastic surgery, or blepharoplasty, is an operation which corrects drooping eyelids as well as puffy bags and bulges about the eyes. These conditions develop as a result of laxity of the eyelid skin or deeper eyelid tissues and protrusion of fat around the eyes. It is not limited to older patients, as many individuals inherit a predisposition toward development of fat pouches at an early age. Eyelid surgery can correct drooping upper lids and puffy bags below your eyes – features that make you look older and more tired than you feel, and may even interfere with your vision, a visual field impairment. It cannot correct fine wrinkling of the eyelid skin and attempting to do so will only cause complications. If the visual impairment is significant your surgery would be covered by health insurance. In some cases a browlift or foreheadlift and/or adjunctive eyelid procedures also required to fully correct the problem. These eyelid procedures could involve tightening the ligament connecting the lower eyelid to the outer eye socket bone rim, tightening the upper eyelid elevating muscle etc. This 33 year old complained of puffy lower eyelids and malar bags. The surgery involved redistributing the eyelid fat by suturing it to the deep cheek fat and liposuction of the fat in malar bag. This softened the line between his lower eyelids and cheeks without creating a sunken eye appearance. No skin was removed. Although fillers could have softened the tear trough they would not have addressed the malar bags. 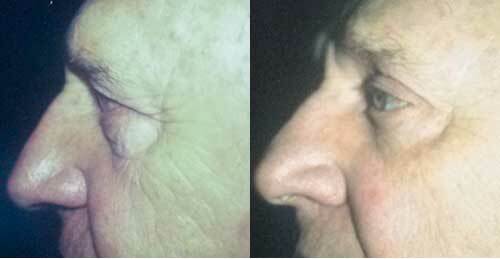 This 62 year old had upper blepharoplasties and a browlift. She is the kind of patient whose surgery is covered by health insurance because the upper visual fields are obstructed. This 44 year old had upper eyelid blepharoplasties and removal of the corrugator muscles that pull the eyebrows downwards, via the eyelid incisions. This patient had upper eyelid blepharoplasties for excess upper eyelid skin and drooping eyebrows. Over resection was prevented by marking the eyelid skin to be removed after manually lifting the eyebrow to its normal location. If the surgeon just removes all of the extra skin the eyebrows will be pulled down even more. This is another example of upper eyelid surgery that would be covered by health insurance because the extra eyelid skin was weighing the upper eyelids down and obstructing vision. 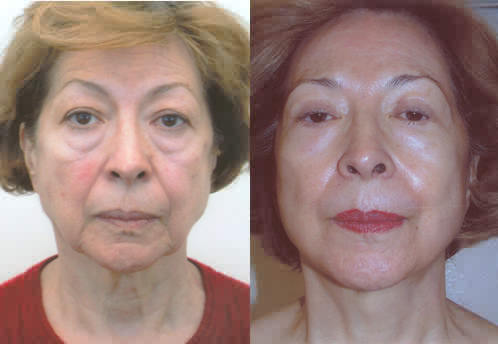 This 60 year old patient had upper and lower eyelid blepharoplasties in conjuction with a facelift. Excess skin was removed from all 4 eyelids and the lower eyelid fat was sutured to the deep cheek fat to clear the deep lower eyelid creases under the lower eyelid bags. Blepharoplasty – Eyelid surgery can improve your vision and enhance your appearance and your self confidence. Realistic expectations are important to be happy with any surgery. As each patient is an individual, different results can be expected in each patient. The available alternatives depend on the exact problem. If the only issue is visible tear trough and palpebromalar grooves (lower eyelid creases) injectable fillers are a good though temporary non-surgical treatment. For mild eyelid skin excess or fine eyelid skin wrinkles alone radiofrequency, laser or chemical peel treatments are viable non-surgical options. They are however not risk free. If vision is impaired due to excess eyelid skin or the lower eyelids bags are severe with much excess skin there are no non-surgical alternatives. As with any type of surgery there is the risk of infection or bleeding. There is the possibility of ectropion (a turning out of the lower eyelid) due to excessive skin removal and/or scar formation after surgery. If due to scar formation and caught early this can be resolved by manual traction on the eyelid or temporary placement of a Frost suture to counteract the downward pull of the scar tissue. There can be a temporary or permanent discrepancy in the level of the lower eyelids due to skin removal, swelling or scar formation. There is the very rare possibility of blindness. Malar pouches (redundant swollen skin over the cheek bones) can be lessened but cannot be eliminated. Xanthelasma (deposits of fat within the eyelid) may diminish with eyelidplasty but this cannot be guaranteed. Fine wrinkles and visible blood vessels cannot be completely removed with eyelidplasty. If sutures are used to tighten the lower eyelid connection to the outer eye socket rim they can break, loosen or become palpable. Some patients develop swelling of the eyeball covering (chemosis) that resolves with eye drops containing an anti-inflammatory steroid. Any of these complication may require additional surgery that may not be covered by health insurance if the original procedure was not covered. Close follow up after surgery can catch an early complication that with proper care can be resolved so that additional surgery is not required. It is imperative that patients comply with postoperative instructions and not miss office appointments after surgery in order to have a smooth complication free recovery. The benefits include improved vision, a more youthful appearance, not looking tired all of the time and getting rid of eyelid bags. Ice compresses are applied for the first 24 hours. You can place 3 wet washcloths in the freezer & serially apply them. Alternatively, a bag of frozen peas can be used as a compress. Artificial tears & eye ointment are prescribed for 4 to 8 weeks to prevent dry eye. There will be discoloration about the eyes for several days, and in some cases this can persist for considerably longer periods. The head is kept elevated, no lying flat or head down position for 1 week. Lower eyelid massage is begun at 6 days after all the sutures are removed to prevent scar formation. False eyelashes can be worn beginning 6 days after the operation. Vigorous or strenuous physical activity is restricted for 2 weeks. Even jogging at 1 week can cause a problem. Most normal activities & work may be resumed within 1 week after the operation. Bruising usually resolves within 2 weeks and can be covered with camouflage make up beginning about a week after surgery. Contact lenses should not be worn the day of surgery or after surgery until Dr. Stone clears you to wear them.